Dr. Qu's research focus includes cell signaling and metabolic regulation of normal hematopoietic stem cells and leukemic stem cells. Cheng-Kui Qu, MD, PhD is a Professor in the Department of Pediatrics at Emory University School of Medicine. 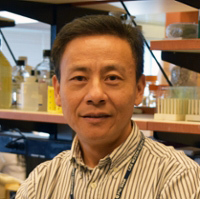 Dr. Qu is a member of the Cancer Cell Biology Research Program at Winship Cancer Institute. Dr. Qu received his Medical Degree from Anhui Medical University in China in 1987. He then earned his PhD in Experimental Hematology from the Chinese Academy of Medical Sciences in China in 1993. He completed his fellowship in the Department of Biochemistry and Molecular Biology, Walther Oncology Center, Indiana University School of Medicine in Indianapolis, IN in 2000. Dr. Qu's research focus includes cell signaling and metabolic regulation of normal hematopoietic stem cells and leukemic stem cells. His research team focuses on the role of protein and lipid phosphatases in normal hematopoietic cell development and leukemogenesis. By studying these phosphatases, they also attempt to develop novel therapeutics for phosphatases-associated blood disorders, in particular, myeloid leukemias.